The team showed that during a process called “cosmic ray albedo neutron decay” (CRAND), cosmic rays entering Earth’s atmosphere collide with neutral atoms, creating a “splash” which produces charged particles, including electrons, that become trapped by Earth’s magnetic fields. The findings have implications for understanding and better forecasting the arrival of energetic electrons in near-Earth space, which can damage satellites and threaten the health of space-walking astronauts, said Li. Soon after the discovery of the Van Allen radiation belts in 1958, both American and Russian scientists concluded that CRAND was likely the source of high-energy protons trapped in Earth’s magnetic field. But over the intervening decades, no one successfully detected the corresponding electrons that should be produced during the neutron decay. 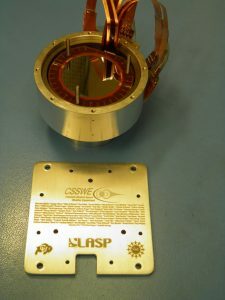 The instrument on CSSWE, called the Relativistic, Electron and Proton Telescope integrated little experiment (REPTile) is a smaller version of REPT, twin instruments developed by a CU Boulder team led by LASP director and Nature paper co-author Daniel Baker that were launched on NASA’s 2012 Van Allen Probes mission. Other study co-authors include researcher Hong Zhao of LASP, graduate student Kun Zhang of CU Boulder aerospace engineering sciences, Richard Selesnick of the Air Force Research Laboratory at Kirtland Air Force Base in New Mexico, Quintin Schiller of NASA’s Goddard Space Flight Center in Greenbelt, Maryland and Michael Temerin of the University of California, Berkeley. CSSWE was designed and built by the students under the direction of Li and aerospace engineering sciences Professor Scott Palo. More than 20 peer-reviewed scientific and engineering papers associated with CSSWE – which ceased operations in late 2014 – have thus far been produced. CU Boulder graduate students continue to study the data. Read the article in Nature: https://www.nature.com/articles/nature24642.